Severe gods of Norse Mythology are waiting for you to present impressive awards and make your free time really exciting. 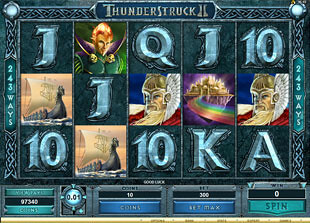 Play Thunderstruck 2 slot machine released by Microgaming and let powerful Thor make you some nice present. 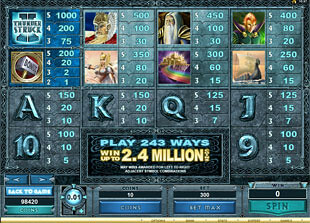 You have 243 Ways to Win this slot. Make a wonderful journey into the lands of hidden treasures and brave heroes. Play this slot machine in no download format without installing special software on your computer. Thunderstruck Logo is the wild symbol. It will complete the lacking symbols to create winning combinations. Your awards are doubled every time Thunderstruck Logo substitutes for other icons. It is a great opportunity to get better prizes. For example, you can receive 1,000 coins or $500 instead of 500 coins or $250 if you get 1 Thunderstruck Logo substituting in the combination of 5 Thor symbols. To make lightnings and thunder present you a good mood and great payouts you need to choose among three coin sizes offered – $0.01, $0.02, $0.05. This is penny slot that allows you to cover all 243 Ways to Win with quite affordable bets. The maximum is 300 coins that will be $15 if you choose the coin size of $0.05. There are no paylines, but if you play with the maximum coins per line, your prizes should be multiplied by 10 coins plus by the coin size you are playing with. Thus, playing with $0.05 coin size and 300 coins per spin you can win the top jackpot of 1,000 coins or $500 for 5 Thunderstruck Logo. Perhaps, this is the main symbol of this game to look for on the reels. If you want to enjoy plenty of Free Spins presented you can wait for Thor’s Hammer icons on the reels. Getting three or more Thor’s Hammers you enter the Great Hall of Spins. This feature can be retriggered and depending on the number of times you activate it, you will be awarded with different bonus games. 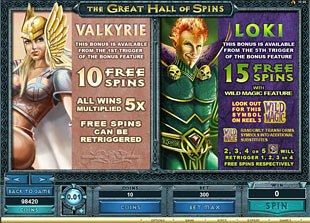 The first trigger invites you into the world of pretty Valkyrie that can present you 10 Free Spins with 5x multiplier. During this feature you can win the greatest prize of 5,000 coins or $2,500. Just get 5 Thunderstruck Logo. Starting with the 5th trigger of this bonus, you appear in the land of tricky Loci with 15 Free Spins and Wild Magic Feature. This extra bonus feature just presents you more wild symbols to win more. 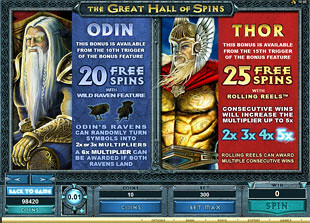 The 10th trigger of Great Hall of Spins provides you with Odin Bonus. This time you will be playing with 20 Free Spins and two ravens that will turn into 2x and 3x multipliers. Wait for them both landing on the reels to play with 6x multiplier. Thor Bonus will be triggered starting with 15th time. Enjoy 25 Free Spins with rolling reels with plenty of consecutive wins. Such prizes also increase the multiplier awarded up to 5x. There is also Wildstorm Feature that can be activated at random. Everything is simple, all 5 reels become wild and you just should collect astonishing awards presented.